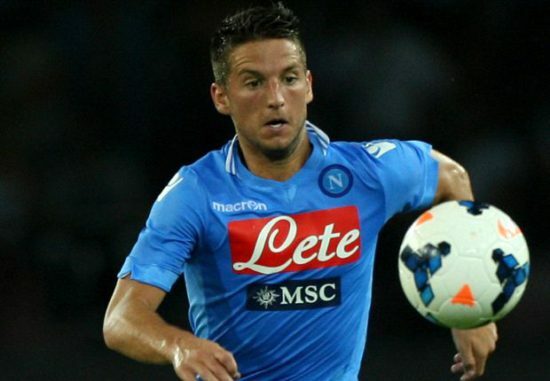 Manchester United are interested in signing Napoli forward, Dries Mertens. The Red Devils are flying high atop the Premier League table alongside Manchester City, their bitter rivals. The 30-year-old forward has lit up the Serie A with some goalscoring displays ever since last season and is reportedly on the wish list of United boss, Jose Mourinho who is a keen admirer of the former PSV star. According to the former sporting director of the Partenopei, Pierpaolo Marino, United have a firm interest in the striker. Mertens who used to be known as a winger in his early days at the Stadio San Paolo has now been converted to a striker by manager, Maurizio Sarri. He has netted an astonishing 43 goals ever since Gonzalo Higuain left the club last summer to join bitter rivals, Juventus and signed a new contract at the club back in May to keep him at the club made famous by Diego Maradona. Despite United boasting the likes of Lukaku, Ibrahimovic, Martial and Rashford, having a player of Mertens ilk can offer options both on the wings and at the focal attacking spot. Mertens won the Belgian Footballer of the Year award in 2016 and has taken that form into this season already. It is yet unclear as to whether United will make a move to exploit his relatively low clause and make him yet another signing as we look to win our first title in five years.